These examples were originally written in a pre-release version of the scripting API, and have now been updated to use the newer editor.selection.selectedItems property. tell front document of application "TaskPaper"
Much cleaner example… I’m updating my docs now! 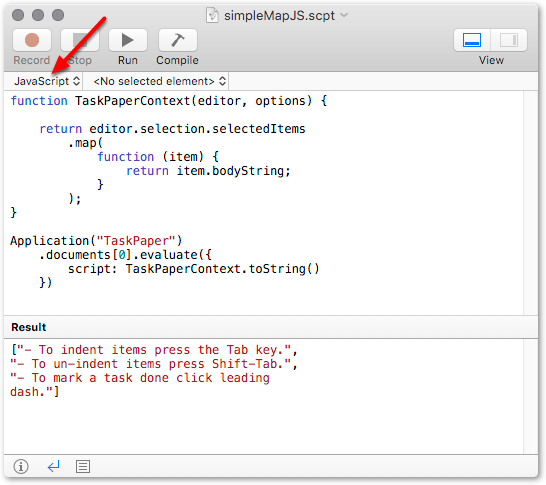 I am trying to run the first example script from above (the one that runs from Applescript context), but it results in the following error. Good catch … the Preview API was a little different at that time. Thanks. So, possibly a related question. 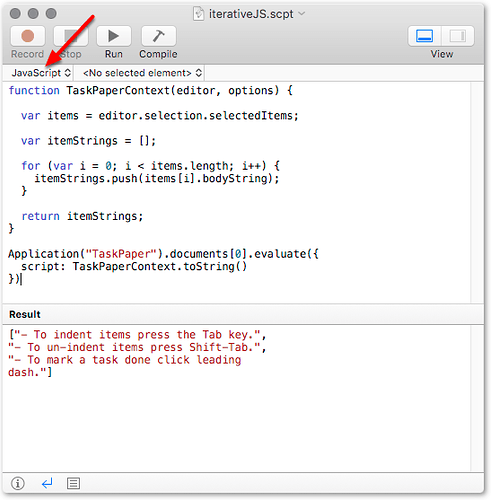 but from the Applescript context using your example above. Is this also an API change, or am I not using evaluate correctly? 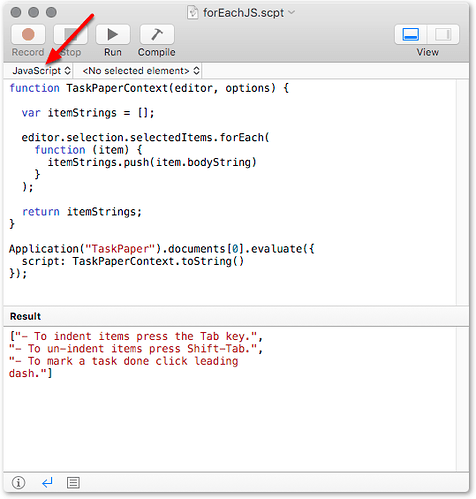 In case you are wondering, I am using the Applescript context because this will be a script that runs from within a FileMaker script, and FileMaker only appears to support Applescript at this time. Do some JXA / Applescript work outside that context, and pass the results in through the options object. Maybe the simplest thing would be to work through a small example ? Anything particular that you have in mind for the next stage ? As far as what I am trying to achieve, FileMaker can output text to an Applescript variable, represented by theText in the script below. 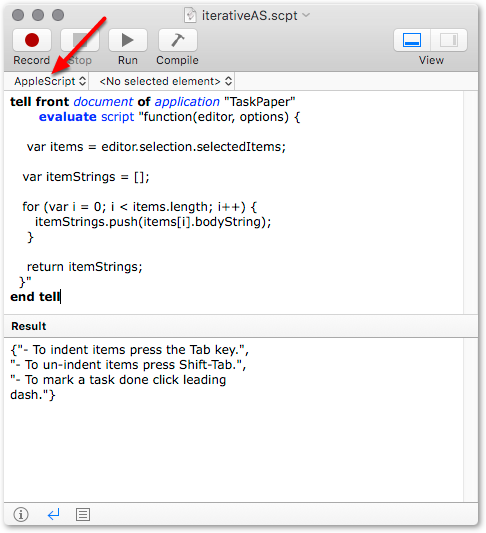 I am trying to pass that variable into a modified version of Jesse’s script so the text from FileMaker can be added to TaskPaper. This code gives an idea of what I am trying to do, but it does not work. set theText to "Hello, World!" You have got one evaluate nested inside another there. All we need is one, feeding it any data through the options object. set theText to "hello again from AS !" Thank you very much, @complexpoint! This works and is very helpful in helping me understand this all a bit more. Now please allow me some time to wrap my head around it.